better informed decisions regarding their treatments and health choices. chronic issues and how a chiropractic regimen could prevent future problems. I originally came to McCauley Family Chiropractic for numbness and tingling in my right arm and extreme pain in my right shoulder. This pain and numbness had not only affected my work and ability to sleep, but my recreational life as well. 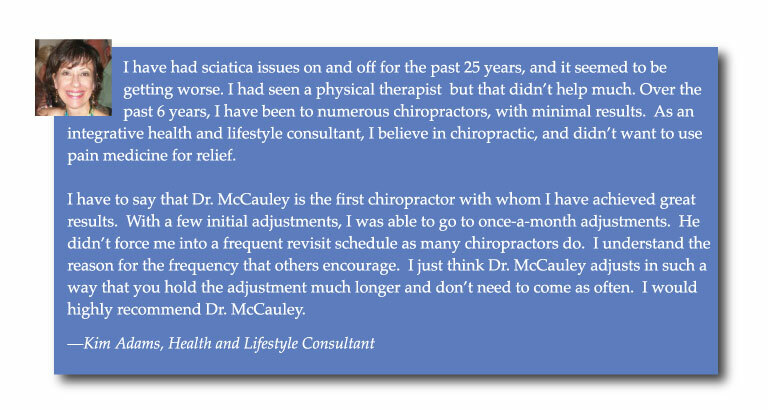 Prior to seeing Dr. McCauley I had been to medical doctors and another chiropractor, received X-rays and even an MRI. From these study results, they explained that the problem came from discs in my neck. The other physicians painted a very dim prognosis for me, saying surgery was inevitable. I happened upon Dr. McCauley and immediately knew that he was different. He listened intently to my symptoms and concerns, and for the first time I felt as if I were being treated, not just seen! I continued care with Dr. McCauley and have had great results. Without surgery (and all of its risks), the pain and numbness are now gone, I’m sleeping better, and am even back out on the golf course. Being a busy pastor often means caring for others without taking care of myself. The problems with stiffness, neck and back pain became part of daily life. At least twice a year my back would go out of alignment, causing extreme pain. I had tried several chiropractors but could not find lasting relief. I am blessed to have met Dr. Mark McCauley. He is excellent at listening and looking at the whole body health. The alignment he gives has loosened my back and neck to full mobility and improved my posture. I drive to his South Hills office from the Greater Pittsburgh Airport area and it is worth the drive. The office is a relaxing experience. When Dr. Mark is finished doing my adjustment, I feel like I am in heaven and hold the adjustment longer than with any other chiropractor. Dr. Mark has healing hands and is truly concerned for his patients. Thanks to Dr. Mark, chiropractic has changed my life! I have had low back pain going down into my legs for over 20 years. I have seen at least 5 different chiropractors regularly over this time but had only minor improvements that wouldn’t last. I assumed that my back pain was something that I was just going to have to live with. I came to Dr. McCauley and, because I had seen other chiropractors, he explained before treating me that his techniques were going to be different than what I was used to. He was right, and I was amazed how I felt after my first treatment. The pain was almost all gone. I followed his recommendations and I am now pain free. Finally after a 20 year search, I can honestly say that I have found my chiropractor.